American cattle farmers are winning the efficiency game, raising larger cows at a lower cost than decades ago. But according to an article published in The Washington Post, today’s bigger, beefier cattle mean butchers have had to alter traditional cuts of steak or even invent entirely new ones. Freaky. The Post, citing Department of Agriculture data, finds that “since 1975, the weight of the average cow at slaughter has increased by roughly nine pounds each year—from 996 pounds in 1975 to a whopping 1,363 pounds in 2016.” It’s the result of more advanced breeding techniques, advances in livestock feed, and of course, good-old-fashioned all-natural growth hormones. When butchers are confronted with these larger animals’ muscles (where steaks come from, FYI), they’ve had to get creative. 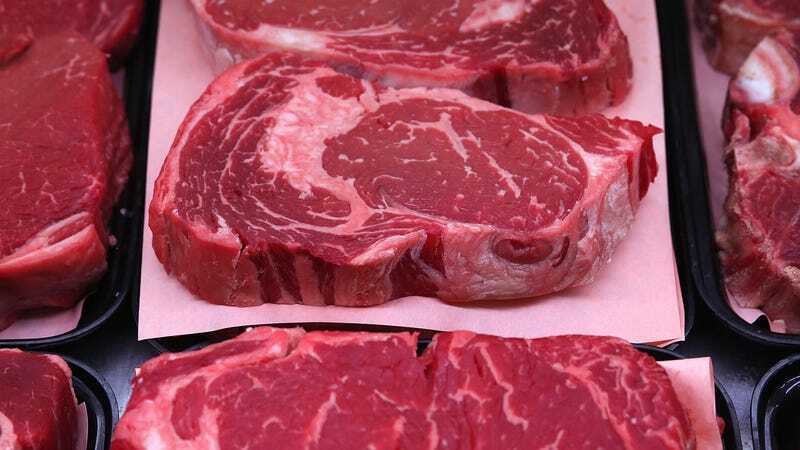 A forthcoming study from the journal Food Policy finds that the surface area of the average rib-eye steak has increased about two square inches since the early 1990s. Butchers, especially those preparing beef for mass-market chain groceries, have begun slicing steaks thinner to keep steaks’ weight the same. They’re also coming up with new cuts like rib-eye caps and rib-eye filets to dice up larger beef muscles. There’s no reason to think American cattle will shrink any time soon. China, the U.S.’s third-largest trade partner, announced this year it would resume imports of American beef after a 14-year ban. That will only mean more markets and more demand for cows. Whether consumers want those cows to be fed Brawndo and pumped full of hormones is another question. Some say that mega-sized chickens (whose breast fillets can now weigh more than the entire animal did decades ago) taste “gummy.” That’s not what I want when I’m shelling out for a porterhouse, personally.